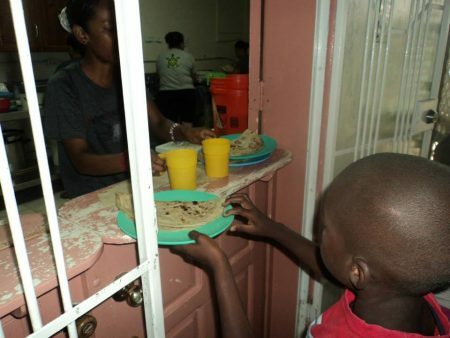 “I Was…I Am” feeding program provides daily breakfast and lunch to 100 school children in Roatan. These children who would otherwise go without meals come from the The Hill community and surrounding areas. Local volunteers and 2 paid employees prepare and serve meals daily at a local church. CTSC and our sponsors partner with local churches, businesses and individuals to maintain this ministry. Daily prayers and devotions accompany the daily serving of meals. Frequently volunteers provide special programs and distribute school supplies and clothing. While public schools are available in Roatan, students and their families must provide uniforms, books, school supplies and transportation. CTSC maintains a list of worthy students in need of support for basic education. Currently, more than 30 children are being sponsored by donors through our ministry. Hundreds of other students receive book bags and school supplies through CTSC. Many of our volunteer teams have arrived with basic clothing and supplies for their week’s stay so that the bulk of their luggage space could be filled with crayons, markers, rulers and composition books!